Maggie always liked Abigail’s ideas and turned her chair to face her as soon as the group was together. At first, Vanessa was looking around the room in a great show of disinterest, and Xenia’s eyes kept flicking nervously to her tablet. But as Abigail’s words flowed, they began to be drawn in. In fact, if anything, they were staring at her a little too much. She started talking faster to cover her jitters. She drew pictures in words for them — the Every Tuesday Girls Club. They would use the time they were left hanging around in church to have meetings. Father Andrew had told her to do it; he had told her it was a good idea. When Abigail realizes the important task that Fr. Andrew has given her to do, she turns for help to the four other girls she knows from church. They’re not all friends of hers — or not yet. Sweet Maggie is her best friend, but Abigail really doesn’t have much in common with shy Photini, odd Xenia or brassy Vanessa. But Abigail wants to do big things, and suddenly she has been given an opportunity — Fr. Andrew wants her to help people with their problems, and if she does that, he’ll make sure she gets a copy of the very special icon that she saw of St. Abigail. 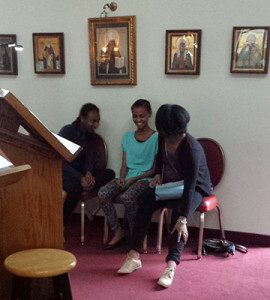 Some of the girls in our church enjoying a little camaraderie between services. All of that is based, as we find out later, on a kind of misunderstanding. But Abigail believes that she really has been given this mission, and she doesn’t want to try to do it all by herself. So she reaches for something that little girls incline toward almost by nature, I think — a secret club. When I was a girl, my sister Lynn and I would form clubs from time to time. Ideally, we would have had more than two members — I think we did actually try to solicit additional members once — but we moved around in the way so many military families did, and so we could be most certain of only we two. And I don’t remember ever feeling like our clubs were at a disadvantage because of our small numbers. We would come up with rules, have secret codes and gestures, have stated goals. I think we tried to establish our own form of currency, and I remember designing a flag. And judging from the March sisters from Little Women, and the Bronte sisters secret fictional worlds, it is typical for girls to want to bunch together to create culture and get things done. Why? I’m not sure, exactly. But I think that it’s the way that God made us. We really are called to help people. It may not be as clearly stated as I have put it for the purposes of telling a story, but I think that women are moved at a basic level throughout their lives to try to be of real assistance to those around them. 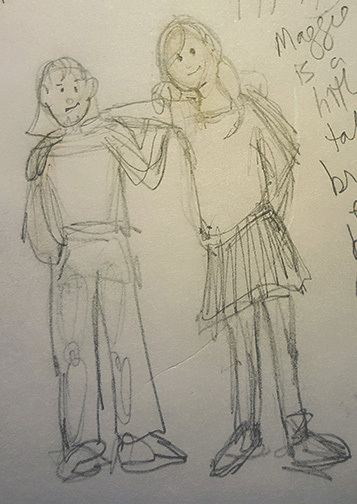 I always liked the friendship between Maggie and Abigail — even sketched something to help me remember it. But in time, all the girls become important to each other. Abigail makes a bold move in stating her case to other, including some girls she hardly knows. I wish I had been so brave. Sometimes in church, we’re thrown together with people that we honestly have very little in common with. But we are connected by one thing, and it ends up being a more important bond than any other — we are brothers and sisters in Christ. We may have different personalities and come from different backgrounds, but we pledge our lives to each other during the worship service, and we love each other because Christ first loved us. During this time of Lent, I think we need each other more than ever. During these weeks when we struggle to overcome our difficulties, pray more earnestly, worship more often, how good it is to share this secret life — so different than any the world has in mind — with others who have been called. God willing, that really will be our slogan.